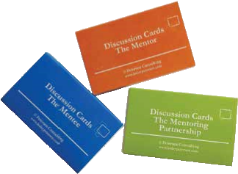 Use these card sets as a tool to get people thinking and talking about mentoring. Each card presents you with a statement made by mentees and mentors which have been collected over a number of years. The cards are a great tool to use in mentoring training workshops and group meetings. Someone picks a card and the group discusses the implications of the statement. These cards provide the opportunity for people to really explore who the mentee is, the role of the mentor, what mentees need from the mentoring support, and the benefits of a mentoring partnership. The MAP™ is a tool that encourages you to identify and determine the core attributes – professional skills, knowledge and interpersonal qualities – that you expect and require of the mentors in your mentoring programme. Bundle of 5 Mentor Attributes Profile pack. The MAP™ is a tool that encourages you to identify and determine the core attributes – professional skills, knowledge and interpersonal qualities – that you expect and require of the mentors in your mentoring programme.